You will be seeing the below static navigation in the joomla article page. Login to the Joomla Admin section. Roll your mouse over the Extensions option, and click Plugins. 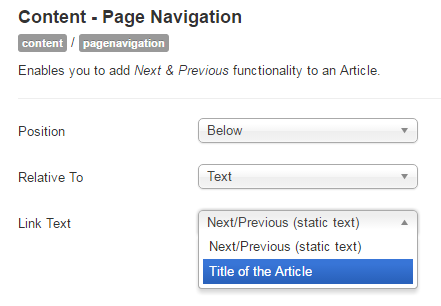 Search for Content - Page Navigation in the plugin and Click the Content - Page Navigation link. Now, Click the Link Text dropdown, then select Title of the Article and save it.